V.com weekend vote: How often do you use gut strings? Have you ever used gut strings? Do you use them on a regular basis? Our recent article about the Handel and Haydn Society make me think more deeply about gut strings. In that article, Baroque violinist Aisslinn Nosky spoke at length about the allure of the gut-string sound and also about the staggering inconvenience of playing on them! Basically, they break so often and lose pitch so easily, that one needs to become a "virtuoso tuner" to play with them effectively. There are a number of kinds of gut strings: pure gut and wound gut, which is wound with aluminum or silver. As for pure gut, they are generally made from sheep intestines. "There are some excellent makers in North America," Aisslinn said. She named two American makers, Damian Dlugolecki and Dan Larson's Gamut Strings. "A lot of craftsmanship goes into it, and it takes a lot of time to make them, and their prices fluctuate a little bit depending on how expensive their material is," she said.. "There are a lot of makers in Europe, too, and some people order them from Europe. It's like a hobby, this world of strings." When it comes to wound gut, those are a bit easier to find (and contend with). Pirastro sells a number of varieties: Eudoxa, Chorda, Gold Label, Oliv and Passione. Eudoxa strings, for example, have a sheep gut core but are wound with either aluminum or silver. I just changed my 1930's french shop violin from Dominants to Eudoxa's out of a sense of nostalgia. They were more quiet and warmer sounding with super low tension... I loved them until a started playing at church and other places and remembered how often you have to tune... It was worth it for the time being. I remember about 35 years ago that I had to mow a couple of yards to pay for a set of Eudoxa's instead of the Gold Labels that I was using during that time. I probably switched to Dominants around 1982 or so and haven't looked back with the exceptions of some Warchal Karenols I tried earlier in the year. More accurately, "I learned to play on wound gut strings, but no longer do." I'm not planning any serious solo performances, so satisfy myself with what lasts longer than gut and plays better than steel, i.e., synthetic. However, there was nothing to touch Golden Spiral when they were at their best, or Eudoxa/Olive. I think they had a sensitivity that even today's synthetics don't match. I tried a set of Pirastro Passiones a while back. I loved the tone, but the expense was just too much. And they don't tend to last as long. I'd definitely go back to them if I were in a better place financially, or if I actually made $$$ with my violin. The Baroque era is my principal interest both as a player and as a listener. However I also enjoy both Renaissance and Classical era composers as well. I have a modern viola that I play occasionally with wound gut strings but I primarily play a modern copy of a Baroque era viola and a modern copy of a Baroque era bow. I am not a purist, I do not insist that it is inappropriate to play Baroque era music on modern instruments and strings. Many can only afford one instrument or choose to spend all of their savings on one instrument. I say explore everything that interests you with enthusiasm and curiosity. It is not possible for us to know what performances of that era sounded like with certainty. We can make assumptions and we can research diligently but in the end, there was probably as much variation in technique and style then as there is now, perhaps even more. My thought on the subject is to consider Shakespeare. No one expects King Lear to be done in modern English or in modern costumes. No one is offended that it is usually performed in period costumes and in a form of English we rarely hear. It is part of the charm and of the experience. It is exalted and admired for what it was and is. However, Shakespeare has been done in a modern context. That works too if you have an open mind about it. Time is the final arbiter. While going to University (In Scotland, UK) I joined a Baroque ensemble, unaware that we played genuine baroque instruments and remakes. I have had to relearn violin technique to play on the baroque violins and since learning how they played at this period, I actually prefer the pure gut strings to synthetics for genuine baroque music. Even though you end up having to retune many times within only one hour.. I suppose it is hard to relearn after playing modern violin for all of my musical life but I believe it has been very beneficial to play the historical accurate instruments at this point! Give gut strings a chance to settle in a given environment and they're as stable as any synthetic. I do not agree with those who say gut doesn't last long (although true for the E), for my experience is that they last for well over a year without fraying - and that is on 8-10 hours of orchestral playing/week, plus practice hours. Unlike synthetics with their complex multilayers, the simplicity of plain gut structure ensures that they retain their playing quality without deterioration for a very long time. Fingernails short, a fairly low action, don't hammer fingers down on the strings, and apply sweet almond oil regularly - all help string longevity. I find projection is as good as anything I've had from synthetics, and the tonal quality is of course unequaled by other strings. It is the gold standard that the synthetics are trying to emulate. The violin of course was designed for use with gut, and metal wasn't considered until the very end of the 19th century. My preference is for strings by Savarez. I started playing violin in about 1937. My only non-gut string then was a steel E. My A and D strings were unwound gut and the G was wound with something- probably silver. I suffered through hot summer months when the strings never stayed in tune for more than a short while. Winters were not much better. In about 1950 or a little later I discovered synthetic strings. I have never looked back. At present I have Vision Solos on both my violin and viola along with a Hill Stark E on the violin and a Kaplin A on the viola. They sound great, stay in tune and last long. Gut strings are great if one enjoys historical accuracy, but if one plays for pleasure synthetic strings are the way to go. I use synthetics on my good violin and my fiddle. I also have a "Baroque Style" violin that I play as often as I can without straying to far from my normal violin and fiddle practice. My BS-violin (Baroque Style) has a shorter bass bar. 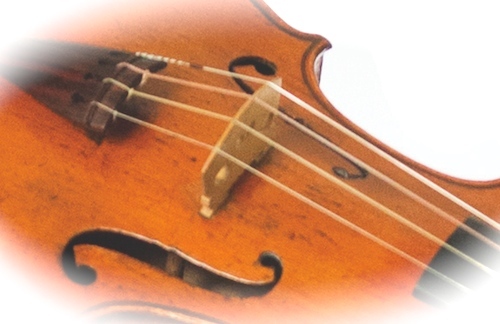 The neck looks baroque but the angle and configuration are modern, thus "baroque style" not a "baroque violin". The BS-violin came with steel strings and a not too proper baroque bridge. I put Gamut strings on it and had Sandro Cocco fix the bridge and do a proper setup, except the neck. Having difficulty getting comfortable with my fiddle after playing the BS-violin led me to quit using a shoulder rest on my good violin and fiddle also. Though I still use chin rest on my non BS-violins. Third option here: "I sometimes play on gut strings." I play on three old hand-made fiddles. My 1883 instrument does especially well with wound gut. It's warm here much of the year. Summers are long, hot, and humid. Yet I've found that, with strict, consistent tuning, re-tuning during a session isn't a major issue. A compact floor fan on low speed about 10 feet away helps a lot -- by keeping moisture from building up on the fingers. The wound-gut types I've most recently used are Gold Label, Eudoxa, and Oliv. With Eudoxa and Oliv, I won't use the regular D-G. The tone breaks or crushes too easily. I use the stiff Oliv D and the stiff Eudoxa G. Pirastro recommends the stiff versions for modern players; they withstand intense bow pressure much better, and I notice better pitch stability, too. Still, even the stiff Eudoxa D sounds a bit pale on the instruments I've tried it on; but the stiff Oliv D brings these instruments to life and really makes the instruments ring, so I use it instead. I won't use the Oliv A -- I've read too many unhappy stories here on v.com about its sub-par pitch stability. My 1921 fiddle comes to life with a Tomastik combo that I really like: A - Vision Solo; D - Peter Infeld Aluminum; G - Infeld Red. The 1869 violin delivers a better sound, to my judgment, with Infeld Red A-D-G than it did with Eudoxa or Oliv. FWIW, I use steel E's on all my instruments, usually Goldbrokat medium or Westminster. With steel E's, I get more sheen in the high notes than I do with a wound E, and I get stronger sympathetic vibrations on A-D-G.
Haven't yet tried pure gut. I always use Wound Gut G and D strings, a pure Gut A string, and as long as they were available, Squier E strings. (Unfortunately, these are no longer available, and I have been trying to find a satisfactory replacement ever since.) I play on a modern American violin, made in 1941 by my father Samuel A. Stochek (Luthier in NYC, now deceased). I have performed as soloist, chamber music and orchestral player. Intonation has never been a problem: just tune carefully. Yes, for outdoor concerts, where the strings go out of tune more frequently because of heat, dampness, cold, etc., and sometimes shows, where there is no time to tune, I will use a different violin with just steel or synthetic strings. But in my opinion, nothing matches the sound of the wound/gut combination for G,D,A strings. In my opinion gut is clearly unexcelled for tone. The problem, of course, is stability. My fairly recent experience has been using Passione strings on two different violins for two years each. During summer with the house humidity stable and set to 50%, and the violins remaining inside, little adjustment was needed but usually a little tweaking had to occur on one or more strings to begin with but this then remained reasonably constant through an hour or so of playing. In winter with the house humidity reduced to 30% to avoid inside ice buildup from condensation on windows in a northern climate, perhaps tuning might have been needed a bit more often. I've always felt the violin sounds best outside in warmer months compared with the desiccated sound indoors at lower humidity during winter. I found Passione playability to be fine, and somewhat similar to the Obligato strings I used before and switched back to after, with earlier trials of many other synthetic brands. I reverted to synthetic primarily because I was taking the violin out of the house frequently to play with others and the very frequent tuning that was then required was just a nuisance, especially in fast-paced performance situations. Regarding longevity, one set of Passione strings that I left on an instrument for about two years lasted that entire time but naturally the sound quality degraded, going flat. I switched out the set on the other instrument more often. I did have to replace at least one broken string, as I recall an A, but that was after an extended period of use (months). I used the Passione E so did not have problems with that failing. I'm now thinking of stringing an instrument with either wound or unwound gut again to leave inside under temperature and humidity-controlled conditions for use in recording in a home studio, but am unlikely to again want to take a gut-stringed instrument out for playing with groups. At the moment I've got one instrument tuned to A=415 just to experiment with, but typically tune to 440. The last time I used wound gut in any quantity was back in high school, when Dominants were starting to find their way into the mainstream. Later I tried Prim and Tonica. More recently, I've tended to use some combination of Evahs and PIs, depending on the preference of the relevant violin maker. I did, however, do a few performances with a period-instrument group, including a run in a Rossini pit orchestra. For that, it was unwound gut E, A, and D. With a wound gut G. It took a little fussing to get the tailpiece in a good position for that, but the overall effect was very good. The E was surprisingly brilliant, and if it weren't so hard to tune without a fine tuner, I'd think about using one full-time. Perhaps using one of the balls from a steel E-string on the fine tuner would keep it from breaking. Among other things during that project, I learned to stop playing sharp-- at least, on that instrument! Synthetics have such fantastic brilliance that they sound OK whether they are in tune or not. When gut strings are played sharp, they agree with nothing on their own violin or with neighbors, and all power evaporates. A useful discipline. I also tried the Heifetz tricolore rig on an instrument, but either because of setup or summer weather never got it to sound fabulous. That might need some experimentation. Perhaps a different bridge would make a difference. Luthiers today tend to fit bridges assuming that Dominants or something like them will be used. Heifetz, on the other hand, used to insist on unwrapped A and D for his students. Shumsky used to do the same with his students, at least as far as making them use an all-gut A. One theory I have discussed elsewhere on the board is the idea of the after-length between bridge and tailpiece. With synthetics of different weights and various wrappings, it's hard to get each string to be in tune with the main pitches. My guess is that it's probably easier to get more than one string to play a useful pitch with plucked below the bridge when gut is used. Weights of strings can vary, of course, but at least you don't have manufacturers' wrappings messing up the system when you're using gut. Is it possible that a couple centuries of sympathetic vibrations created by a gut-string setup might have helped break in a lot of the good older instruments? I don't know, but am having good luck with modern ones having fussed with the wrappings on PIs and Evahs to get the correct (5th+ 2 octave up) pitch on the after-length. "...Basically, they break so often and lose pitch so easily, that one needs to become a "virtuoso tuner" to play with them effectively...."
I grew up on gut strings, mostly Eudoxa and Gold Label. Later I was pleasantly suprised by Kaplan, and through graduate school and beyond performed with period ensembles on unwound gut, both Chorda and Damian D.
In my experience: I don't ever remember breaking a gut string. I think if you break strings, whether gut or synthetic, you have a setup problem--some sharp edge somewhere--and not a string problem. Especially with lower pitch. Eudoxas seemed to last forever, although the winding on the A was a weak point. Also, while gut is certainly less stable, given enough time, it will become reasonably stable, even outdoors. How much time? I'd say you have to give them two weeks. A very popular setup for many period players is to have synthetic G/D with gut A/E. It's not only more stable, but the sound is similar enough. While I've occasionally returned to gut, I always end up abandoning them. For modern music, especially high position work, gut strings are too weak, and produce too many of the wrong overtone, resulting in a muddier tone. It really depends on the violin, though--the better the fiddle, the better they can play. But they don't seem to work as well on modern fiddles, and can make wolf tones worse in spite of lower tension (lower tension produces more overtones, by the way). At Mr. Robinson's suggestion earlier this year, I tried Tricolore pure gut D and A strings with a silver-wound G. I immediately fell in love with the G. I didn't find the two pure gut strings particularly finicky, though I had to tune the wound G pretty often (this could have to do with my particular instrument - I don't know). Within a short time, they did start to fray, but the A kept its tone for about 3 months, and the D was good for more like 5 months. When my A string went, I decided to look a bit further with that particular string, since my violin didn't really like any of the A strings I'd tried yet. I now use a Russian Style A, and it feels good on my instrument. I will probably continue to use Tricolore's gut G (with silver winding), although I may experiment a little more on the D with different brands, gauges, wound vs. pure gut, gut types, etc., until I decide on one that I like best. I have never tried a gut E, since I like my little fine tuner, and my Goldbrokat E does the job nicely. I'm not sure why Scott Cole seems to think plain gut strings must needs be low tension. This is not the case at all. In fact gut is available in an infinite range of gages. You can have very high tension if you want it. Now, if what you want is high stress on the core--to make better overtones on the lower strings--then the only solution is to wind the string--whether gut cored or not. Nobody mentioned varnished gut. Some find this to be a superior solution to the wear and fraying issue. Of course it affects the sound but not necessarily in a bad way. A note on why the wound G needs to be tuned more than the plain D and A: this is because it is wound with metal. the D and A (and the e if you had it) all come and go with the temperature and humidity equally but the wound sting does not. Another thing on wear. While it is true that some plastic cored stings may last "forever" their sound deteriorates quite rapidly. I would suggest that gut actually has a longer sustained stable sound than synthetic strings. By the time a gut string is actually physically deteriorating, your synth string would have been long since replaced, if you cared about the sound and overtone (falseness) quality. Another detail: Both Dlugolecki and Gamut Strings make wound gut as well as plain gut...in fact they have some really interesting kinds of windings.